So now that we have decided to hurry up and get this house "on the market" ready, it makes me a little sad. And angry. Because why, Andrea, why have we waited so long to get our home looking all pretty? While Anth has been working on a long list of "to do's", I have been in charge of the inside. Which means I have been spending useless time doing things such as lining shelves and putting holes in our walls. But I like to think someone will appreciate it down the road. These are a couple of things in the kitchen that have been making me super happy these days. Because, you know, I am adult and things like shelf liners make me happy. We don't have a huge pantry in our kitchen, just a small one built into our cabinets. I came across this shelf liner on Amazon (they also sell it at Marshalls/TJ Maxx) and I immediately fell in love. This was also my idea of an exciting Saturday morning. I though I would completely hate the process, but it was super easy and super fast. Now it makes me happy when I open this puppy 78 times a day because I have no control in the snack department. 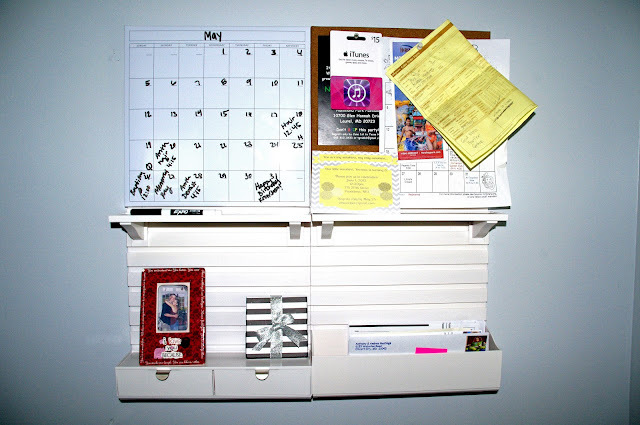 Thanks to Jen I saw that Martha Stewart came out with a line of wall organizers. Because I am obsessed with both Staples and Martha, I knew I had to have it. We had a dry erase wall calendar on this wall before, but I knew I needed something more. I love paying my bills the good old fashioned way....by mail. Don't ask me why, my mom loved doing it and so do I. I am also too cheap to pay the $5.00 fee that comes along with all of our payments. So this was the perfect solution! It is totally customizable as far as what you can do with it. Each "square" is separate so you can create your own little board as big or as small as you want it. I plan on covering the cork with pretty fabric sometime soon, which probably means I will get round to it sometime next year. Just a few cute updates that my husband totally doesn't care about, but make me so very happy.